Those called to proclaim the gospel in Northeast Asia face a seemingly impregnable wall of culture that is highly resistant to their message. The author tackles the question of why the great outlay of human and material resources over the centuries has not produced a greater receptivity to the gospel. He seeks answers in the theological categories of missio Dei, ecclesia Dei, and regnum Dei. Biblical, doctrinal, and theological considerations as well as church history and reformation history inform this study. Where does mission originate? What is God s intent for the church? As God comes into the world in love, what does his coming look like? Where does one find God s presence and how does one discern and build on that presence? These important questions for the articulation of mission are the foci of this book. Gaylan Mathiesen is Professor of Mission and Evangelism at Lutheran Brethren Seminary in Fergus Falls, MN, USA. He has also taught at Northwestern College, St. Paul, MN, Trinity Bible College, Kursk, Russia, and Japan Lutheran Brethren Seminary, Sendai, Japan. Mathiesen spends his time volunteering on numerous committees and leading discussions on world missions. He is a member of the Evangelical Missiological Society, American Society of Missiology, and Association of Professors of Mission. Mathiesen has a Ph.D. from Luther Seminary, St. Paul, MN, as well as degrees from Lutheran Brethren Seminary, Fergus Falls, MN and Northwestern College, St. Paul, MN. He attended the Japan Missionary Language Institute, Tokyo, Japan. This is a critical contribution to and a must read for those doing missiology especially in the context of Buddhism and North East Asia. I recommend this book highly. --Charles Amjad-Ali, Director Islamic Studies Program, Luther Seminary, St. Paul, Minnesota. 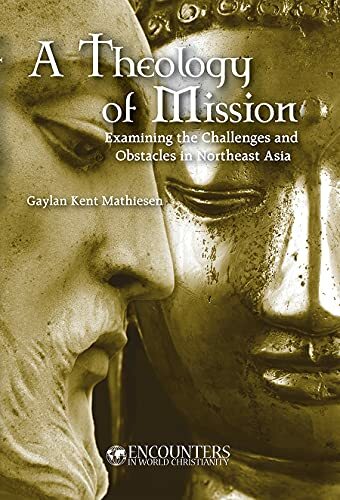 In this rich and carefully researched study, Dr. Gaylan Matheisen provides a solid Trinitarian theology of mission, explores the approaches Buddhism and Christian missions respectively have taken to North Asian contexts, and offers helpful suggestions for Christian engagement with the cultures of East Asia, that have been shaped so profoundly by Buddhism. This is a significant contribution to the ongoing discussion of the gospel in East Asian contexts. --Harold Netland, Professor of Philosophy of Religion and Intercultural Studies, Trinity Evangelical Divinity School, Deerfield Illinois.